The Village of Winfield, Illinois is a vibrant community known for its quiet neighborhoods and bustling business districts. With many community groups, places to worship, and cultural activities, we offer something for the entire family. We invite you to visit and see for yourself! Watch the VILLAGE BOARD MEETINGS live at 7 PM on Comcast Channel 10 and AT&T U-Verse Channel 99 on the first and third Thursdays of each month. Meetings are replayed on alternate Thursdays and can also be viewed in the MEDIA CENTER on this website. Winfield has a new FACEBOOK page! Please take a minute to visit us! 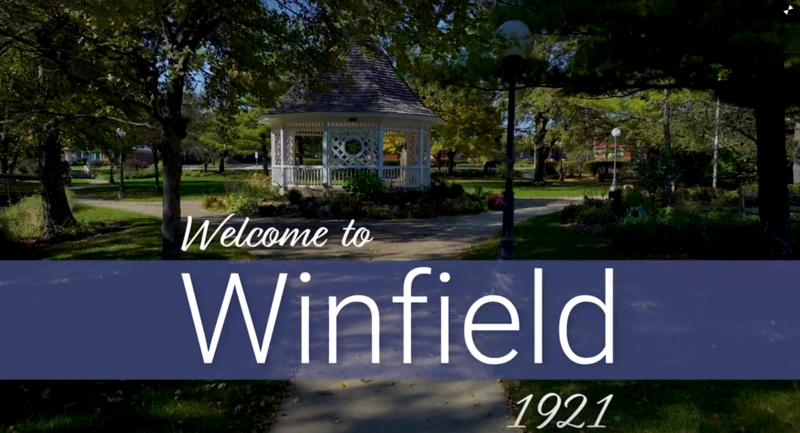 Winfield now has its own community promotional video! Thank you to all those who contributed to the production of this impressive video coordinated by the Economic Development & Communication Commission. Click HERE to view extended version! A Draft of the FY 2019-20 Village Budget can be viewed here. A Public Hearing on the proposed budget will be held at the April 4th Village Board meeting with a formal vote scheduled to be held at the April 18th meeting. The Village has an online payment option administered through AccessMyGov.com (Formerly Epay), which allows residents to pay utility bills, police fines and parking permit renewals online. AccessMyGov.com accepts all major credit cards and electronic checks. A convenience fee will apply for this service. To access Utility Billing accounts, you will need your 12-digit account number and your PIN number (both can be found on your utility bill). AccessMyGov.com will allow you to view your water & sewer account information online. Click HERE to be directed to AccessMyGov.com for your utility bill payments. The Automatic Bank Draft Application for Utility Billing is now available. It can be accessed HERE. To access Police Fines, click HERE. To access your Permit Parking Renewal, your will need your Customer ID which can be found on your invoice. Click HERE to be directed to AccessMyGov.com for your Permit Parking renewal payments. For additional information, please contact the Village Hall at 630-933-7100. PROGRESS REPORT on 2017 Strategic Plan. The full report can be viewed HERE. FY 2018-19 FINAL BUDGET can be viewed HERE. Due to the size of this file, please allow time for downloading. Village Code (4-2-6) prohibits the burning of landscape materials. Recreational burning permits are required in some situations and must be applied for 3 business days in advance. You may view the entire portion of the Village Code that applies to burning restrictions by clicking the tab on the left. Village Code (8-4-6) regulates outdoor water use. From May 15 through September 15, watering lawns, trees, and gardens may only occur from 4:00 PM through 10 AM on days corresponding to the property address. There are additional restrictions that apply to new lawns. To view Section 8-4-6, click on the Village code tab on the left. Street parking is prohibited between the hours of 2:00 AM and 6:00 AM of any day. Overnight parking requests may be made by calling 630-933-7160 or by registering online. If you are approached by someone selling merchandise or services, ask to see their Village of Winfield Solicitor ID; if they don't have one, call 911. Do not allow solicitors in your home. Do not provide your credit card number, cash, or check before receiving merchandise or services. For great information about trees—including how they clean our air, hold our soil, filter our water and beautify our world visit arborday.org.